The FWCD Falcon Club will publish three full-color seasonal sports programs that will include advertisements and sports information on all Upper School athletic teams. This is a great opportunity to highlight your business or honor your senior players, cheerleaders and band members. 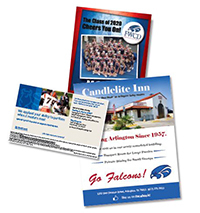 Ad sales help the Falcon Club support student-athletes and coaches, as well as the FWCD athletic program. Your ad will run in all three seasonal programs. You may provide the ad camera-ready or, for an additional fee of $75, our graphic artist will create your ad. For more information on the Falcon Club, contact Falcon Club Sports Program Ad Sales Representative Cynda Wroten at cyndawroten@hotmail.com or call 817.999.4156. Please let us know by July 27, 2018, if you would like a space reserved. Deadline to submit material is August 1, 2018. MECHANICAL SPECIFICATIONS: Please submit high-resolution digital ads in PDF, eps, tiff or jpeg file format. Reserve my space, and I will submit my ad on or before August 1, 2018. I will use your graphic designer for an additional fee of $75. Please contact me. Deadline to Submit Artwork and Senior Ad is August 1, 2018.